2017 have been full of ups and downs, experiences and challenges. but it was a good one as I bid farewell to it! you can check out my letter to my 25th year old self and share how was your yearly closing too! so let's rock 2018 together! today i'll be sharing how to plan your goals for the year! trust me, you'd probably see it much more achievable as i did when i did mine! 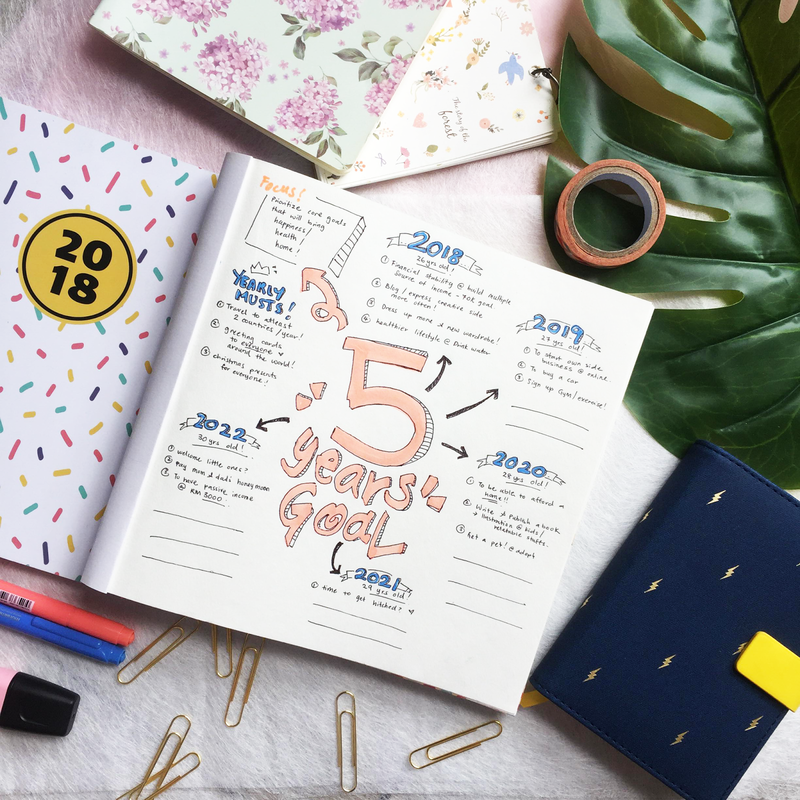 Goals spread are usually overviews and decorative art for your journal and its usually the core main pages for your planner! so, there is no limits! you can play with stickers, washi tapes, copic markers and even just plain pen and colours like mine for a start! 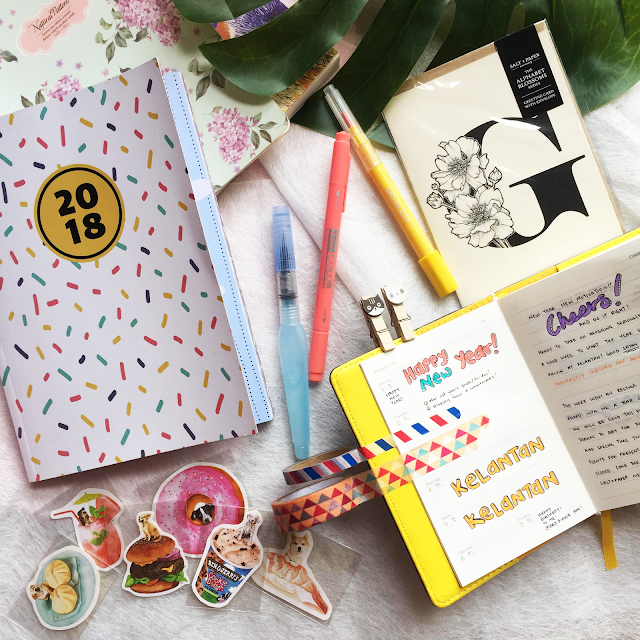 I like the fact that bullet journaling is flexible for you because it's your own timeline for the year so you can opt for whatever that makes you happy! but if you're like me who is really new to it, and prefer to start off to get in track noob style. 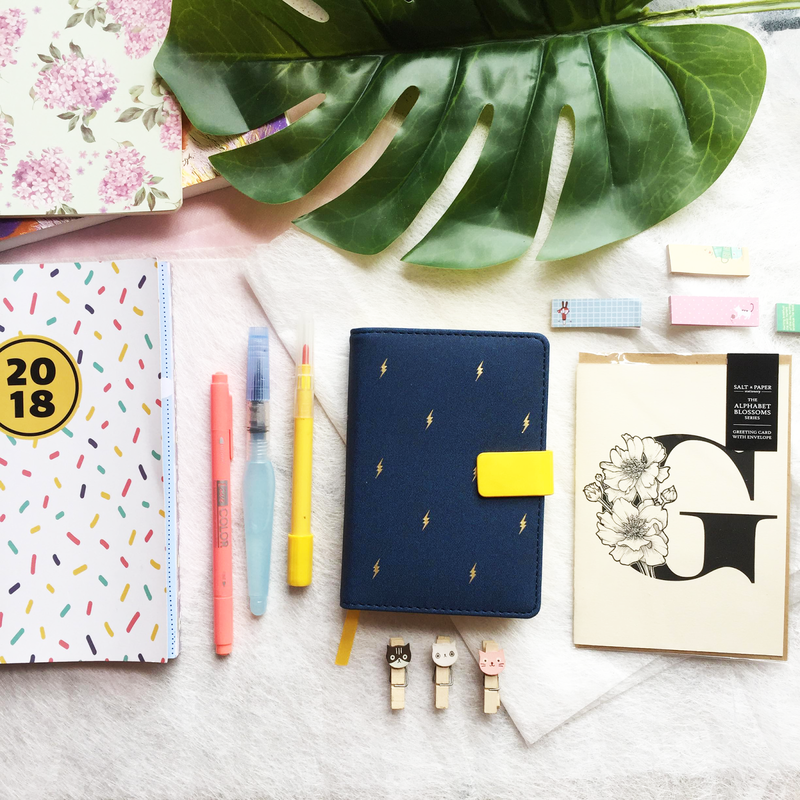 join me with the pre-set usual printed planners! who said they can't be just as magical? so for my goal spread, i broke it down to a few important pages for myself to set my goals right! 5year plan. i know that there's always changes and you can't predict 5years of activities, but its a good way to keep track on your travel plans, investment plans, your relationship plans because these are usually for the long term outcomes and its good to have atleast a general guide so you'd fit them in for next year's yearly planning! I MADE SURE I PUT IN MY AGE SO YOU'D ACTUALLY HAVE A SENSE OF COMMITMENT TO IT. because everyone wants to have atleast something to be proud of, as they age! and we are not getting any younger, so never waste precious years. here comes the details in sorting out your resolutions into these categories! Income goals are my earnings and incomes i plan to achieve, so here I aspire to get at least RM6k a month. and by breaking down to how i will achieve this goal, it gives me a sense of understanding where will the money come from and how hard i need to work on to achieve that goal in terms of savings - how much amount i need to save for the month, investment - how much to invest that it will return a passive income of what value, part-time work, freelancing, whatever it takes to reach it! so if you have a big number for the year, make sure you break it down to monthly/daily - helps if you can list all possible income in detailed figure too! passive incomes and monthly salary. Impact goals is my goals to contribute back to the community! I've always wanted to be part of an NGO and do good to the needed. but never had the time to actually work on it. this helps in self development and i guess its a sense of achievement and the feeling of being able to contribute really brings positive vibes to a person itself! hence, this year, and probably most of my years will be for the animals. SPCAKK, my goal is to help these shelter animals. Health out of most obvious reasons, is one of the most important aspects in life! I bet everyone wants a diet and a good body. probably on everyone's resolutions out of obvious reasons! hahaha but yes, I am definitely needing this long awaited healthier lifestyle of mine. so to start it off, my main goal is not exercise - hahaha but to drink 8 cups of water each day. just because i am a very well trained cactus. but its not good. along side is to atleast move around and do some simple at home workouts with a 48KG average goal in mind. so let's start small. Q1 practice meditation and find time to getting to know myself! Q3 to practice my japanese again so i can visit the amazing country again to visit my host families! break them down as specific with a numbered value and details as you can! if you want RM20K savings, you'd need to save RM1.6K a month, thats RM56~ a day. so, save that amount everyday. do or die. its that simple. HOW? how are you going to do it? WHAT? what needs to be done to get there? WHEN? when is the goal deadline you give to yourself? WHO? who will be able to help get to your goals? WHERE? where can you achieve/execute those plans? WHY? is to identify if the particular task will be helpful? 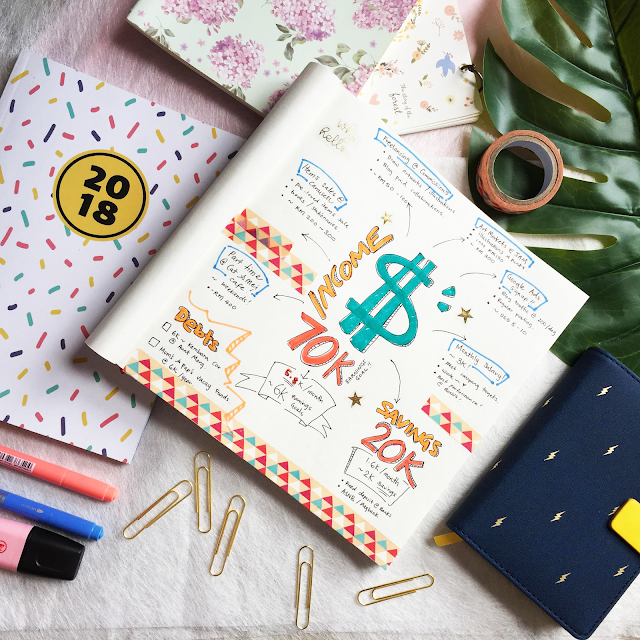 have you gotten your 2018 planned out yet? its never too late to start your goal planning! hope this will help you in building your own goals! it doesn't have to be a daily bullet journal, and planner and notebooks works just fine! 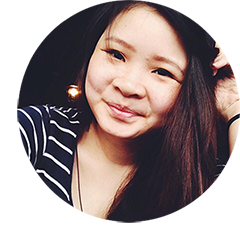 I do a weekly gratitude review for myself to keep the habit of daily planning! you can too! :) its your life your story, so make everyday count! 4 comments on "How to Plan your Goals for the Year Effectively! " yes yes! cantik kannnnn~ kegilaan sudah tu. Thank you for the sharing! Very useful, will plan it out! I saw Kelantan in the last image, why with that? Hi Joanne! glad its helpful for you!! and all the best plan it out!